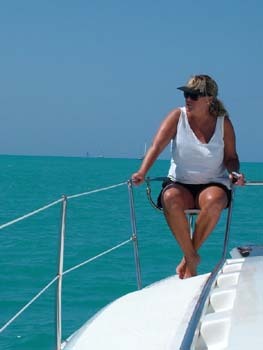 Apr 1 - Yesterday, Deb and I decided we were going to call it quits on cruising. We've had a great time cruising but decided that we were putting our boat up for sale. 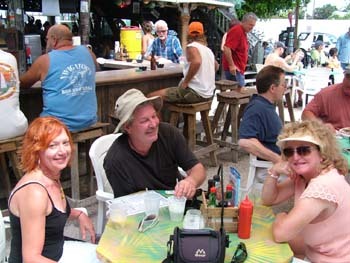 We found a great place here in Key West and found out we could afford it. Actually, we met the tax assessor and were able to make a quick deal to get the taxes down each year. We've seen quite a bit on the water but decided that we might as well settle down in a town where having fun is considered to be the right thing to do. It was also a very amazing day because we had someone come by the boat and after a little negotiation, we may have just come up with a price we can both live with. So, we may be land bound before you know it. Closing on the house is 45 days but if we don't sell the boat right away, who really cares anyway, there are always those wonderful sails just before sunset. By the way, I don't know if you know it or not but today is Tuesday, April 1st...... What really happened is that I cleaned the hull yesterday morning and then we went off bike riding in the afternoon. 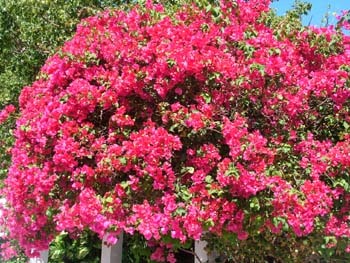 Today, we are planning on taking the camera for some pictures of all of the flowering plants in full bloom. It seems that we missed a few of these last year when we left in mid-March. Apr 2 - I did receive some emails today about the fact that I "got" a few people with my message above. Ok, sorry. We haven't given up cruising. We are still planning on Mexico next year so much more good stuff to come. We are doing boat projects here in Key West. We really like having a clean, well maintained boat so that is what we are up to. This morning, I was off on my bicycle to a canvas shop. I can't tell you how much it hurts to take something I can fix to a canvas shop. However, I don't have my sewing machine here. 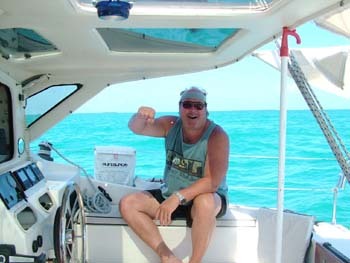 So off I went and dropped off my canvas that extends from my bimini aft to provide shade which needs immediate repair. In addition, I took the window covers I made from sunbrella so they could duplicate them in a 65% shade cover that we can see through that will be made in black. 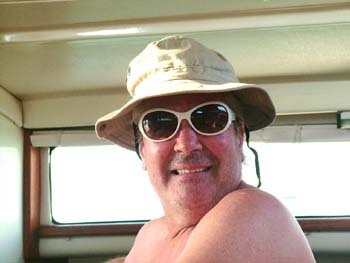 Deb will be happy because she can see out and I will be happy because it will be cooler in the boat. I just wish I could have done the work because I know I could have saved a hundred bucks. 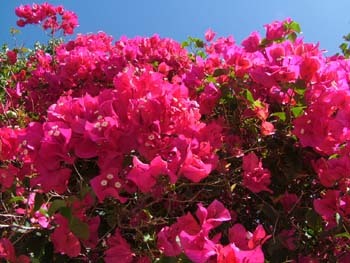 On the way back, I took some pictures of the foliage that is blooming. 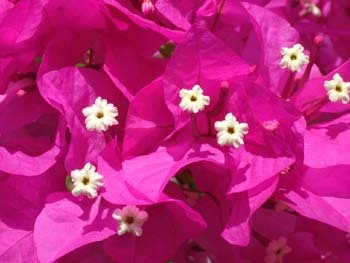 I had only seen red/pink blooms but as I rode around I also saw purple and then I saw yellow. 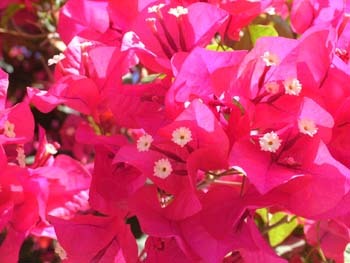 I don't know what they are but they are really pretty when you are riding your bike on the back streets of Key West. This afternoon we worked on the boat. Deb decided we needed to sand and redo the woodwork that is on the back of our boat. Since we have an early 105, we have wood outside and wood means maintenance. I picked up a sander this morning and after we sanded the wood, Deb did her Cetol thing on it and it is looking good after the first coat. Tomorrow we do the second coat and then the next day we do the clear coat. After we finished, we cleaned up and decided to take showers. 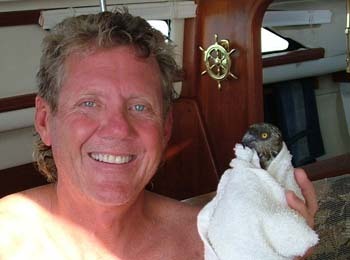 Of course it has been awhile since Jimmy Buffett has had a good shower too. I took a shower first and thought it is time for Jimmy to get wet. Of course I'm clean and the first thing he does after I start spraying him with water is that he goes CRAZY and jumps in the water. By the way, since we clip his wings all he can do is flutter above the water. Wouldn't you know it the tide is coming in and Jimmy is going away from the boat. Let me think, the last time I saved someone it was Deb in Titusville. 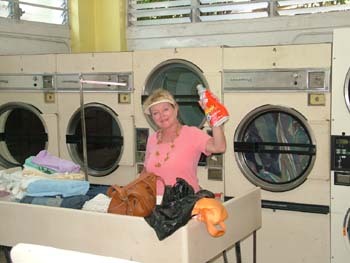 As you can see, things go through your mind quickly as you are jumping into the saltwater erasing your earlier washing. I swam after Jimmy and was able to pick him up about 10 feet from the boat. I swam him back and carried him back up the ladder only to give him another bath but this time inside the cockpit. Of course I had to give myself another shower too since I'm also covered with saltwater. After we finished, Deb took the picture to the left just for the website. Where was she with the camera when I was swimming around? Tomorrow, we stain some more and then we are off to the pool. It should be a great picture moment. Apr 4 - Yesterday, Deb continued with staining on the outside board and I picked up water. We had big plans but found I was getting a sore throat which meant we canceled the pool thing and decided to just go to lunch. After splitting a lunch at Caroline's we decided to stop by Schooners to hear a guy play some original music. Who did we run into? Bill and Bette Gary. You might remember we ran into them in Georgetown too and they are the owners of Green Turtle Bay. It is amazing how small our cruising community really is. There are quite a few people who own or live on boats but not near as many who actually move. We had a great conversation and met a couple that Bill and Bette driven down to spend the afternoon with - Bob and Liz Woodward. 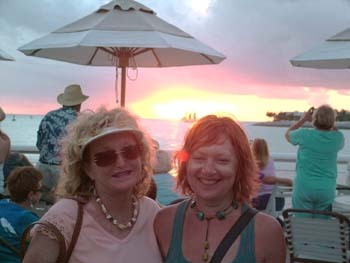 We had a great time catching up and then Deb and I headed back to our boat because we had committed to a happy hour on another boat at 4:30. This turned into a great time too. We started out doing a little bit of confirming troubleshooting with his charging/battery system and I agreed he had bad batteries. Then we got down to happy hour and a tour of his boat. It is a Shuttleworth designed Cat and it was 44 feet by 25 feet. They had purchased and completely refitted the boat about 6 years ago. They did a wonderful job and the boat really showed well. Apr 5 - Boring, I've been sick for the last two days. Sore throat, drainage, you know, the common cold but at least we are in paradise. I did take the time to do an analysis of our expenses from last year. The boat took most of the money at over 30 percent not including fuel. You can see it in our budget but you have to go to the December 2007 entry to look at it. I'm not sure anyone actually looks at our budget anymore but the percentages were interesting. Tomorrow we have a friend coming over so I have to get better. I'm cooking a seafood pasta that includes lots of veggies plus artichokes seasoned with pesto sauce. It is really good by the way. I keep promising pictures, tomorrow is the day. Apr 6 - We just finished a great dinner with our friend Pat, of Pat and Paul, from Missouri. 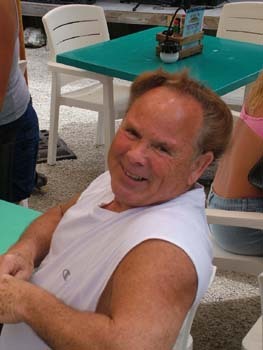 Pat came down to Key West to spend a month working for H&R Block doing taxes. She has been working non-stop since she arrived. I think she had a great afternoon off hanging with us on the boat this afternoon. Of course we just had to have some great appetizers of salmon and dip when she arrived and then made an early dinner. For the food buff's, I sauteed onions, red, yellow, and red peppers, artichokes and mushrooms. I added salt, pepper, garlic and of course a bit of Pesto too. Next we added fish which had lime juice along with some great seafood seasoning on it too. All of this was finished and added to some pasta which made up a great seafood pasta and we just simply "pigged out." Pat (and Paul) have been great friends forever I think. By the way, she also reviewed my Turbo Tax stuff before I submitted it today. We actually get a refund and I didn't mess anything up, Yahoo. We had a great time and I took her back to the dock at about 6 pm. I'm still getting over my cold but as it ends up, so was Pat. We all had a great day. Tomorrow, we are finally ready to get off to the pool and some more pictures. Apr 7 - Wow, last night was exciting!!! 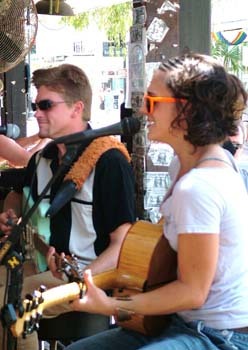 No, we weren't on Duval street in downtown Key West. Rather, we were in over 60 knot winds. It all began when I heard some wind at the start of this front and went outside to check on things. This was about 2:15 am. I saw that a small cushion had blown over so I decided, in my infinite wisdom, to take the dinghy and see if I could find it. I was about 100 feet from the boat wearing only my shorts shining my dive spot light around when I heard the noise of the real wind coming. I barely got back to the boat with the dinghy when the wind hit. Deb was also up by then and I asked for her to get the engine started (read here - DEB, GET THE ENGINE RUNNING!!). The wind was blowing as hard as it was in that tornado we missed in Pensacola a year and a half ago except this time we are anchored in what is known as poor holding off of Key West instead of being at a dock. Somewhere in all of this we began dragging so I dropped the outdrive but Deb didn't have the engine going yet, it isn't that she can't start the engine, she can do that very well. The reason was that the keys were in the bottom of the box where we throw stuff so they weren't easily accessible. I found the keys and quickly got the engine running because we are now making some good speed towards the boat below us. I put the engine in gear, not worried about warming things up, and was able to get turned into the wind without hitting the boat below us or one of the four metal posts in the area. I also noticed the boat that was below me now was further away and that was because previously, he had been turning in circles on his anchor and it had given way too, so he was dragging. Fortunately, I was no longer a factor for him and my only option was to motor against the wind in place for the next half hour while the wind blew and blew. During this time, I was actually worried that I would snag something or trip someone else's anchor chain but I was just going to have to wait on the anchor until the the winds died enough that Deb could control the boat. All of this seemed to take forever. It was raining so hard that you couldn't see anything in front of the boat through the windshield. I had to look out the side of the boat and try to maintain our position by looking at the land to the right. On top of that, I was really worried someone else would drag into our boat while we were hovering. Listening to the radio, I heard four or five other boats dragging while we were out playing around. Ultimately, the winds died enough that we could get the bridle off and then the anchor up. The anchor was full of weeds and had to be cleaned before it would set again. Darn that poor holding. Of course that can't be the end of the story. I had tied the chair I normally sit on while driving up by the mast because I hate it in the cockpit when we aren't using it. Well that became a problem in 60 plus knots of wind which for the non-sailors means 70 plus miles per hour. In the wind and waves the chair fell over and the chair itself hit one of my hatches. I now get the opportunity to replace another hatch lens because the one in the head is broken. I guess I won't store that chair up there anymore. Oh wait, we don't have the chair anymore. The chair separated from the base and who knows where it went. I looked for it this morning but it was eaten up by Davy Jones. While good old Davy was at it, he also reached up and ripped the American flag off of our backstay along with one of the two clamps. Like I said, it was a very interesting evening. The winds at this time felt like they almost stopped which really means about 15-20 knots so I was able to re anchor and after standing anchor watch for about 30 minutes, I then set the GPS anchor alarm, I went back to bed so I could warm up since it was then 3:30 and more importantly I was freezing. Don't you wish you lived on a boat? 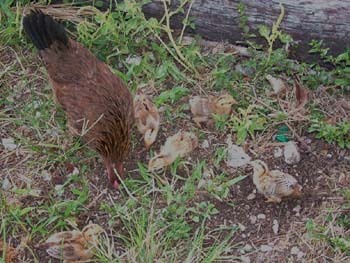 Apr 11 - We had two surprises a few days ago. First, I was getting ready to dinghy in and order replacements for our seat and lens that were lost/damaged in the storm two days ago. However, as I was starting off, I received a call from Bob and Liz who were our friends in St. Louis. They happened to be in Florida and wanted to know if they could drive down to Key West and see us. Of course the answer is SURE. 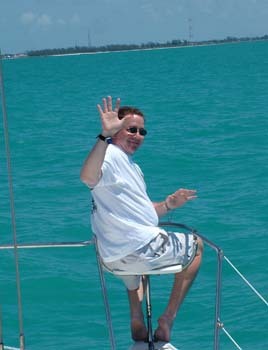 So we made arrangements that they would call when they arrive in Key West so I could pick them up with our dinghy. I'm sure we will have a fun time while they are here. The second surprise was that while I was gone ordering stuff and picking up our mail, Deb happened to see that cushion that we lost two days ago floating by our boat. You have to wonder, where was it? Where did the tides and wind take it over the last two days? And on top of that, she saw it at the same time a guy was coming by in his dinghy. She waved him over and asked if he would get the cushion. He said sure and now after a two day float about, the cushion is back on the boat. I guess it was just out for a swim. Sometimes things are amazing. Of course, some things always happen in three's. Bob and Liz arrived and we went to Schooner Bar to listen to some music. Who walked in but Bill and Randy. These are also friends of ours from St. Louis. I guess you have to believe in the things that happen in three's. Those who happen to have been following us for the last year may remember that we ran into Bill last year too. Things like this are sometimes too much of a coincidence. 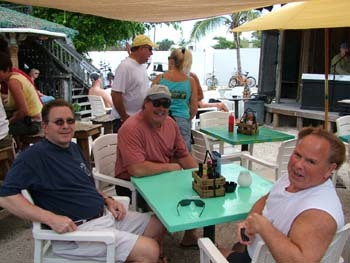 Randy, Frank and Bill are having too much fun in Key West. As you may also believe are we! Below right, you can see Liz, Bob, and Deb too. 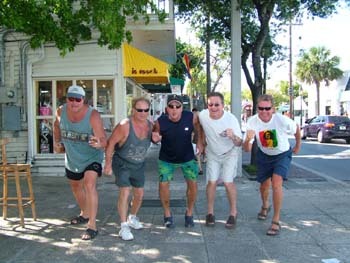 Of course one of the things that people love to do in Key West is walk Duval and shop. Deb and Liz were having too much fun in the shops but, thank goodness, they didn't buy too much. Bob is a character and the only way you can explain him is, he is Bob. You might see that below. We just ran into a few of the locals here too. 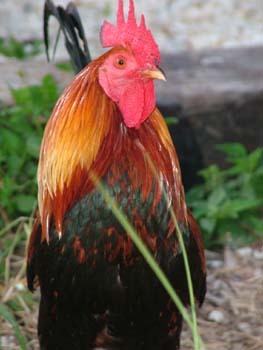 If you have never been to Key West, one of the protected species is the chickens. You can see the roster to the right. And of course you can see some of the offspring to the left. 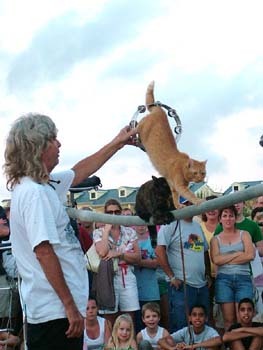 We just had to go over to Mallory Square and see the street performers. As you can see to the right and below, there is the obligatory guy that likes to lay on nails and have someone stand on him. I'm sure that I could do the calculations of the number of nails needed to puncture the skin but I'm just too lazy to do that since it is already proven by the street performers who mush have done this either by math or by trying it out themselves. Yes, the lady did stand on the guy and No, the nails didn't make gaping holes in his back. However, it did earn him a bunch of tips. Now the next place we stopped by was the guy that trains cats. 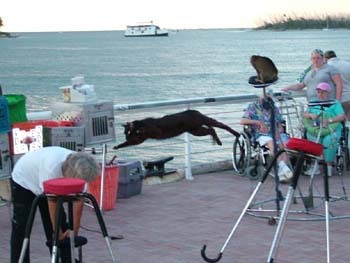 Yes, cats can be trained or perhaps they train you. I know that Jimmy Buffett has trained us! I tried to capture a few pictures that we haven't caught before and these were ones with the cats in the air. I have no clue how this guy does this but Deb thinks it isn't normal. I guess normal is a cat tearing up things and sleeping all day and night while you just pet it until it puts a claw into you. Ok, jumping through a tambourine may be a bit too much. Maybe Deb has a point but they do seem to be happy. 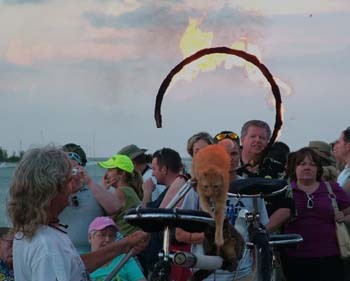 Bob was giving it a good look but that may have been the cat jumping through a flaming hoop too! 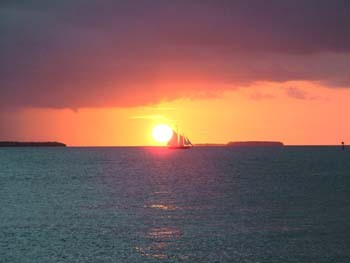 Sunset comes every night but in Key West it is an adventure. First, you have to work your way through street performers and the tourists throwing money at them. Good thing because this is the way they make their living. 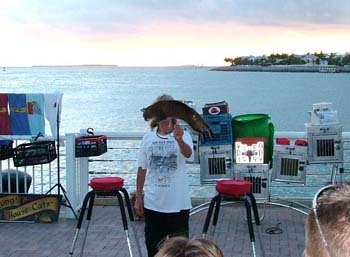 The second part is trying to get a picture on Mallory Square of the sunset. People are everywhere and we just happened to get a few pictures along the way. To the left is Deb and Liz as the sun is beginning to set. Below the sun is almost down and we just happened to get a boat sailing by. Of course I also had to get a picture of Deb as the sun was setting. 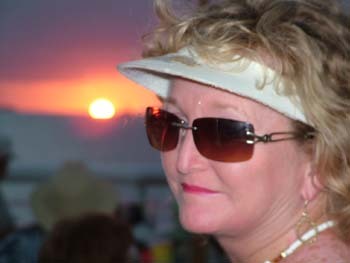 Yes, I did focus on Deb instead of the sun. 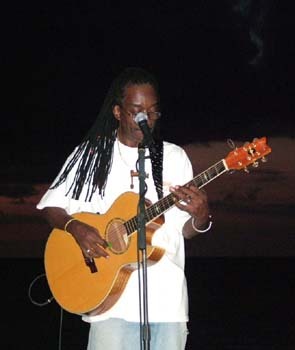 As we left, we went down to the Sunset Pier and just had to see my friend George Victory playing. I had called George earlier in the day and he told me he was sick. I said, go back to bed and we will see you tonight. When you are a musician, you play regardless. There are no sick days. He was amazing and this was when he was sick. Of course he played a great redemption song for me before we had to leave with the rising winds. The next day, we took off to rent bikes for Bob and Liz but we ended up giving them our bikes and went down to hear some more music at Willie T's while Bob and Liz went off to see Key West. 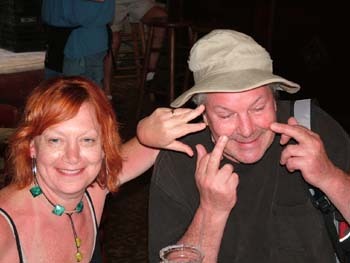 Bob and Liz hadn't been to Key West since 84 so things were different. The guys playing at Willie T's are pictured below left and they were very good. Later, we hooked back up with Bob and Liz and had lunch at Caroline's. Caroline's is a great restaurant and they have a great shrimp and bacon club sandwich! Of course you can see that Bob and Liz also enjoyed the experience. 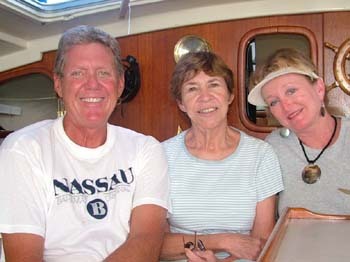 Bob and Liz left way too late and drove on to Anna Marie Island for the evening arriving about midnight. Sorry we had too much fun. Today, Deb and I did the fun stuff like laundry, picked up a knife sharpener and of course I made a trip for 15 gallons of water and 5 gallons of gas. Too mundane but necessary. 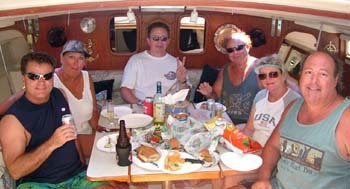 More fun tomorrow since we are taking Bob and Randy out sailing along with a few of their friends. Apr 14 - I have those pictures of us going sailing and we had a GREAT time however I'm working on moving the website to a new host so I haven't updated yet. I've had a free site for years and there was this one nagging problem. I was only supposed to have 5 MB of information on the site. I began to have problems so I checked and I had 92 MB of data and they cut me off. I had a choice. Pay the current people 35 bucks more a month for essentially the size I already have which really means I have to pay more, or move the site to a new location. I chose Dotster for my host and for $300 I will have a host for the next 5 years and I have enough space for 5000 times more information. 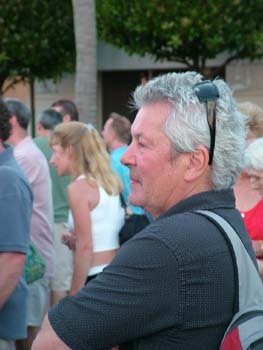 I was familiar with Dotster because I've used them to create two other peoples website's during my travels. In addition, I can also do some commercial work too so that may be a much better deal for me in the future. I'm sitting at the Overseas Market right now uploading data to the new site. It is taking almost forever but the good news is that I won't have this problem again. It is also good news because I get to pretend that I know what I'm doing and get this fixed. Regardless, you will be asked in the very near future to bookmark a new site. For those who might remember my computer problems last year, why is it they always happen in Key West? Thanks in advance for your patience and for those emailing me to update.... I'm trying! 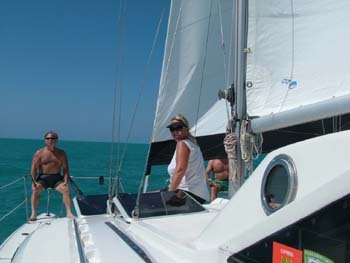 Apr 15 - On Saturday morning, I picked up the group from the Key West Bight Marina. This is a city marina and they don't mind you coming in for friends as long as you aren't chartering. Of course it always helps if you ask nicely. These are great people because they came on time, with food and drink, and they took off their shoes getting on the boat! Great guests and welcome back anytime. We left the dock and were setting the sail within 10 minutes. It was a perfect day to go sailing! We had 12 knot winds from the southeast. That meant we were close hauled (60 degrees) heading out past the cruise ships and into the waters heading for the atlantic. Seas were only 1-2 feet and everyone was having a good time. I traditional fashion, I turned over the controls almost immediately and taught them how to use the autohelm and look out for crab floats. We sailed almost to sand key light and after an hour, turned back towards Key West. Everyone loves the seats I installed on the front of the boat, which are now standard on new boats. 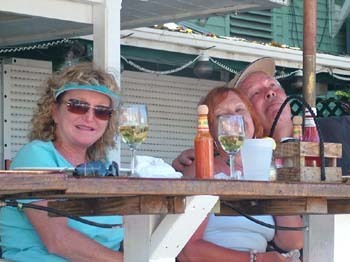 To the right is "Wild" Bill, who to tell you the truth isn't as wild anymore but still loves to have a wonderful time. Below left is Bill, Vinie, and on the other seat is John. Below driving the boat is Frank. These guys all go way back and Bill knew it wouldn't be a problem for everyone to come along. On top of that, he called and asked to which I said, no problem mon. I may have been in the islands too long. They brought along a few life jackets too so we were legal. As I mentioned, everyone loves those front seats in smaller seas. It really feels like you are flying when you are up there just moving along with the wind alone. You met Vinie to the left and to the lower left is Randy. We've known Randy almost forever too. He previously had a number of boats and always appreciates the water. 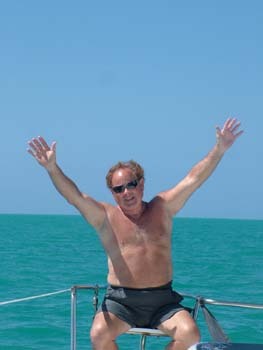 Randy and Bill get down to Key West quite often and it is always a pleasure to have them on our boat. We sailed back past the cruise ships and up past Fleming Key to where the Legacy is now moored. Randy remembered the story from last year and briefed everyone on how it had drug in a hurricane and the operations to get it back floating again. We then went to our anchors and picked up the lines which were in our dinghy so we could have a great lunch. Thanks again for the sandwiches! Pictured left to right is John, Vinie, Randy, Bill, Deb, and Frank. We all had a great time and found we had lots in common. Following lunch we took them back to the dock and dropped them off so we could take the boat back, secure it and head back in on the dinghy. We met up at Schooners and then headed down to Duval Street where we "THOUGHT" they would be having the finals of the Drag Race. Ok, I have to explain! 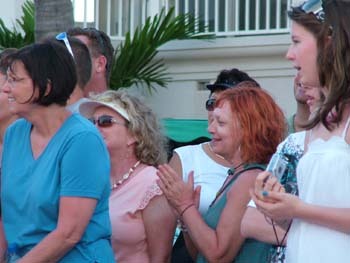 The drag race in Key West means that the drag queens race down Duval in stiletto heels. It is an all afternoon thing and in the end there is a runoff between the fastest drag-sters. Believe it or not, it is sanctioned by the N.H.R.A. There was just one problem, we were a week early. Oops. When you are cruising you sometimes loose track of the day not to mention the dates. So, we had to pose our own race although without the shoes, it wasn't near as interesting. By the way, the drag race is next Saturday. We had a wonderful time and I think they did too. It brings it back to you how much fun and beauty you have on the water. When you live on it you sometimes forget how beautiful your front and back porch are.